Please register if you will attend! On Wednesday, April 4th the CFFC club will host an outing to Wilson Creek. 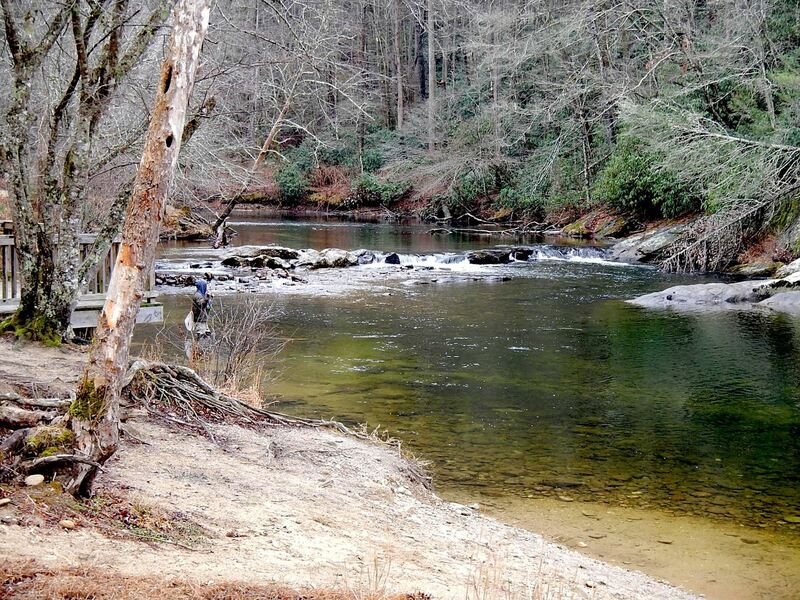 Wilson Creek is located about 20 miles outside of Morganton. For those of you not familiar with the area, take I- 40 West, towards Asheville. Take exit 100, turn right and go about 4 miles. The road will dead end into state route 181. Turn left, go about 10 miles and make a right onto Brown Mountain Beach Road. There is a white church with steeple very visible at this turn. Follow Brown Mountain Beach road about 5 miles, and look for the signs for Wilson Creek, Brown Mountain Beach Resort and Mortimer Campground. You will cross a bridge over Wilson creek just before THE LEFT TURN onto the road to Brown Mountain Beach. You can also go to Google Maps and search for Mortimer NC and it will show you directions. Brown Mountain Beach Road is a combination of paved and dirt (very navigable) road. Suggested length of 8’ to 10’ works well with 3 to 6 wt line. Leader to match rod length in 3X to 5X. Shorter leaders make casting weighted flies a little easier. If desired, you can always add more tippet to lengthen leader. DH Flies- Typically start unweighted, if no action, add weight (split shot) 6"-10" above fly to get flies down to where the fish are. Natural flies- Fish dry flies mid to late afternoon or if you see a hatch coming off. Size is not cast in concrete, so experiment with fly size and pattern. Morning Meeting Place: For those who would like to meet up first for tips, pointers, etc., we will meet at the parking lot just past and to the right of the THIRD BRIDGE that you will cross over. It will be a fairly long drive. (Approximately 8 miles) At this point, Wilson Creek moves from your right side to your left side and the entry to the parking lot is just a few feet past the bridge. Just prior to this bridge, you will see an old abandoned mill on your right. You will then go around a large curve and the bridge will come up soon thereafter. For more detailed directions, see picture below. We will meet in the parking lot at 8:00 AM. Lunch: Please bring your own lunch, beverages, etc. We will meet at the picnic shelter at the Forest Service’s Mortimer campground about 12:00. Weather can be unpredictable so please bring flexible clothing. OK CFFC Members, the 2015 Delayed Harvest season is starting up. During the first week of March there should be some fresh, hungry trout stocked in our local Delayed Harvest streams. For those of you new to North Carolina Trout Seasons, Delayed Harvest is the NC state's modified Catch and Release program. March, April and May, the Department of Wildlife Resources stocks selected streams ( those marked with Black and White diamond shaped signs) for Catch and Release, single hook, artificial lure only fishing. In short all fish caught must be released. On Saturday, March 7th, the CFFC will host an outing to Wilson Creek. 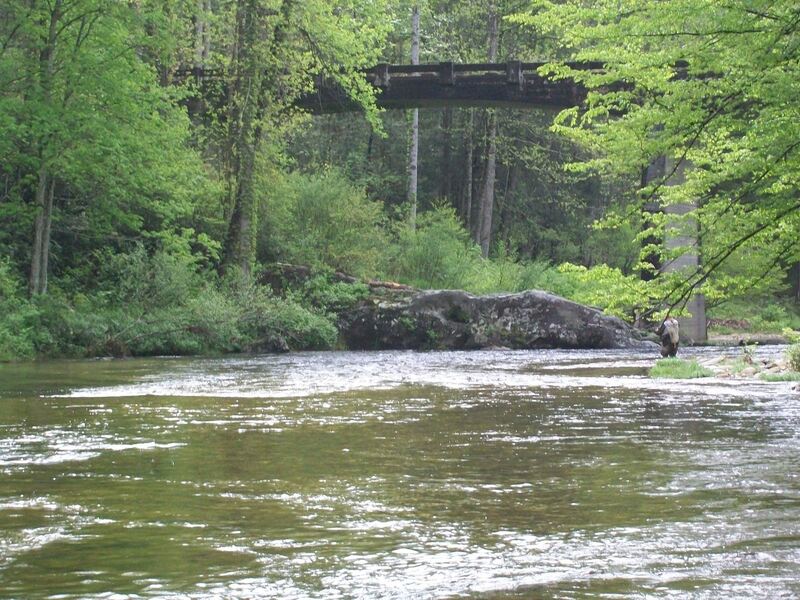 Wilson Creek is located about 20 miles outside of Morganton. For those of you not familiar with the area, take I- 40 West, towards Asheville. Take exit 100, turn right and go about 4 miles. The road will dead end into state route 181. Turn left, go about 10 miles and make a right onto Brown Mountain Beach Road. There is a white church with steeple very visible at this turn. Follow Brown Mountain Beach road about 5 miles, and look for the signs for Wilson Creek, Brown Mountain Beach Resort and Mortimer Campground. You will cross a bridge over Wilson creek just before THE LEFT TURN onto the road to Brown Mountain Beach. You can also go to Google Maps and search for Mortimer NC and it will show you directions. Brown Mountain Beach Road is a combination of paved and dirt (very navigable) road. For those who would like to meet up first for tips, pointers, etc., we will meet at the parking lot just past and to the right of the THIRD BRIDGE that you will cross over. It will be a fairly long drive. At this point, Wilson Creek moves from your right side to your left side and the entry to the parking lot is just a few feet past the bridge. Just prior to this bridge, you will see an old abandoned mill on your right and then round a large curve. The bridge will come up soon thereafter. For more detailed directions, please see the link provided on the registration page. We will meet in the parking lot at 8:30 AM. Please bring your own lunch, beverages, etc. 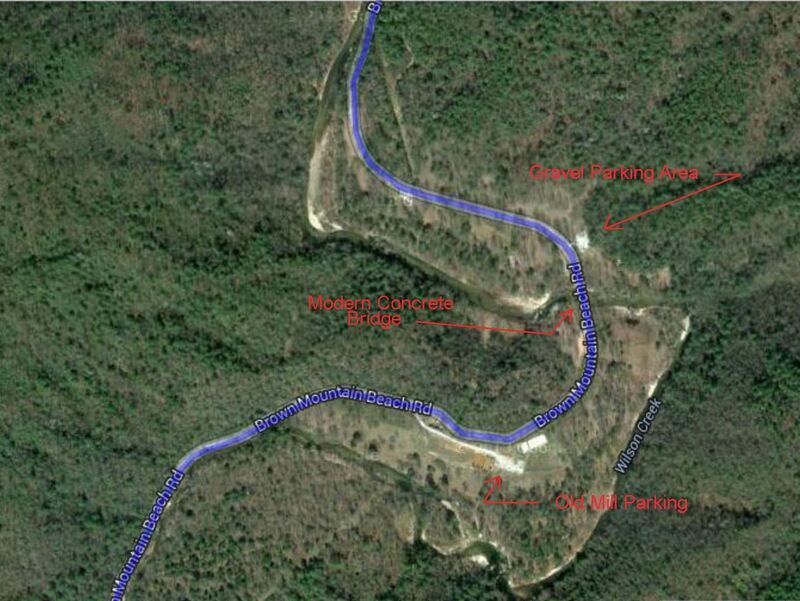 We will meet at the picnic shelter at the Forest Service’s Mortimer campground about 12:00. March weather can be unpredictable so please bring flexible clothing.